Caitlin has a mission. Her goal is to end negative self-talk or "Fat Talk". Is it mission impossible? Somehow, I think it might take a few thousand packs of post-its before I am transformed :) If Snack Girl is anything, she is open minded so she bought some post-it notes and tried it. Operation Beautiful's website and book publishes a compilation of the post-its and the reactions from people who write them and read them. One thing the post-it people do is post anonymous notes in public places. Then, other people find them and report the note's effect on http://operationbeautiful.com. I decided to try this with my own bathroom. I posted " YOU ARE BEAUTIFUL" on my bathroom mirror after purchasing a stack of post-it notes. I gotta be honest, it felt kinda silly. I realized quickly that at my age (41) I am less concerned with beauty than I was in my 20's. Caitlin is 26, and her Fat Talk, where you constantly worry and talk about how fat you are - is something that left me at 26. So, I thought about what I need to be reminded of every day. 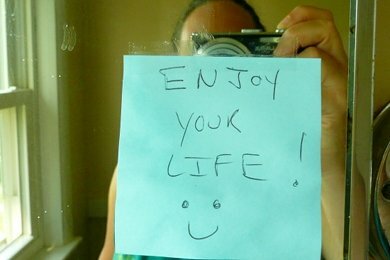 "Enjoy your life" is my post-it mantra. It has been on my mirror for 3 days and I think it is helping. My issues revolve around spending to much time DOING and not enough time ENJOYING. I miss fun because I am too caught up in all the work I have to do. My "to-do" list isn't getting shorter, but my hair is getting grayer. I am going to put some post-its in my purse and post my message in a few spots around town. How fun is that? It is like graffiti without the arrest warrant. What do you all think of Operation Beautiful? Do you have mantra's posted around town? Please share your post-it mantra. Fast Food Fried Chicken Experiment: Is it Fresh Food? This hit home with me today. Yesterday I read an interesting article about affirmations and how using them can help you be successful at things like self esteem and weight loss. I do a lot of negative self talk, and have decided to try this. So this morning, in the mirror, I said to myself: "I can choose happiness whenever I want no matter what my circumstances." And yes, I felt very silly. But something about looking myself in the eye and saying that really was an interesting thing to do. So I'm trying affirmations/mantras for awhile and see if it helps me along my journey! My mom has been doing this forever. Esp when she hated her job and was going to retire soon - she needed motivation and positive reinforcement. This works! Trudie - that is such a beautiful mantra - thanks so much for sharing. I am writing it on a lavender post-it right now! Thank you SO MUCH for this post, Snack Girl! My 10-year old daughter is already talking about her weight and feeling "fat." This is so distressing to me. I tell her all the time how beautiful and perfectly made she is. Some positive, colorful Post-It notes placed around for her to find will also help encourage her in a fun way! I did something similar with Post Its! I put mine in the car and I also opted for the "dry erase writing on the mirror" as mentioned in another comment. In the car it said simply "you can do it" and some clip art. And the mirror message I changed as I wanted to positive messages. It definitely helps to have little positive messages around because when you read it (even if you force yourself to) you are still THINKING the message. I'm in my mid 30's and I think while I'm done worrying about what other people think about me. I do like to feel beautiful. Because to me feeling beautiful is being confident, doing kind things and wearing a smile on my face. I have done it yet, but I think I'll post. "Today is a new day, live it to the fullest" on my mirror. I have a tendency to live in the past and this may remind me to live for the day! I'm a big fan of this idea. It's so sweet. Little messages and notes like these can really make our day! I think its a great idea. Actually, I have been doing this for YEARS before it became an operation. I am HAPPY someone took it on to spread the word.. Basically, THAT is what started my blog...To remind myself that I am a Bombshell!